I must admit that the class-grasping, fakely-elegant “Crafted with wild juniper berries” kept me from reviewing this gin earlier. To market something as being ‘crafted’ or ‘hand-crafted’ smacks of pretense and status-insecurity. In addition to this is the silliness of the “wild juniper berries” bit on the label. The great majority of all juniper berries harvested anywhere in the world are wild. Let me set the mis-leading and class-grasping aspects of the label aside and try the gin. This is obviously a London-style dry gin and it is good. It has full flavor without any harshness. To consider the value of any liquor, I mitigate its cost with its quality. In this case, the quality is good, but the cost is on the high side of things for gin. It is just about twice the cost of Beefeater. Sadly, in my opinion, it is nowhere near twice the quality of Beefeater. 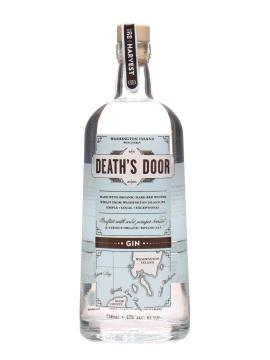 So, I will enjoy the rest of this bottle of Death’s Door gin, but I will probably replace it with another gin that I enjoy even more. Nancy must have put you up to review this, lol!